A microscope (from the , mikrós, "small" and , skopeîn, "to look" or "see") is an instrument to see objects too tiny for the naked eye. The science of investigating small objects using such an instrument is called microscopy. Microscopic means invisible to the eye unless aided by a microscope. The first detailed account of the interior construction of living tissue based on the use of a microscope did not appear until 1644, in Giambattista Odierna's L'ochio della mosca, or The Fly's Eye. It was not until the 1660s and 1670s that the microscope was used seriously in Italy, Holland and England. Marcelo Malpighi in Italy began the analysis of biological structures beginning with the lungs. Robert Hooke's Micrographia had a huge impact, largely because of its impressive illustrations. The greatest contribution came from Antoni van Leeuwenhoek who discovered red blood cells and spermatozoa. On 9 October 1676, Leeuwenhoek reported the discovery of micro-organisms. The most common type of microscope—and the first invented—is the optical microscope. This is an optical instrument containing one or more lenses producing an enlarged image of an object placed in the focal plane of the lenses. 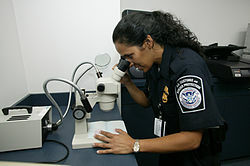 "Microscopes" can be separated into optical theory microscopes (Light microscope), electron microscopes (e.g.,TEM), and scanning probe microscopes (SPM).Optical microscopes function through the optical theory of lenses in order to magnify the image generated by the passage of a wave through the sample, or reflected by the sample. The waves used are electromagnetic (in optical microscopes) or electron beams (in electron microscopes). Types are the compound light, stereo, and the electronic microscope. Optical microscopes, using visible wavelengths of light, are the simplest and most used.Optical microscopes have refractive glass and occasionally of plastic or quartz, to focus light into the eye or another light detector. Mirror-based optical microscopes operate in the same manner. Typical magnification of a light microscope, assuming visible range light, is up to 1500x with a theoretical resolution limit of around 0.2 micrometres or 200 nanometers. Specialized techniques (e.g., scanning confocal microscopy, Vertico SMI) may exceed this magnification but the resolution is diffraction limited. The use of shorter wavelengths of light, such as the ultraviolet, is one way to improve the spatial resolution of the optical microscope, as are devices such as the near-field scanning optical microscope. Sarfus, a recent optical technique increases the sensitivity of standard optical microscope to a point it becomes possible to directly visualize nanometric films (down to 0.3 nanometer) and isolated nano-objects (down to 2 nm-diameter). The technique is based on the use of non-reflecting substrates for cross-polarized reflected light microscopy. Ultraviolet light enables the resolution of microscopic features, as well as to image samples that are transparent to the eye. Near infrared light images circuitry embedded in bonded silicon devices, as silicon is transparent in this region. Many wavelengths of light, ranging from the ultraviolet to the visible are used to excite fluorescence emission from objects for viewing by eye or with sensitive cameras. Phase contrast microscopy is an optical microscopy illumination technique in which small phase shifts in the light passing through a transparent specimen are converted into amplitude or contrast changes in the image.A phase contrast microscope does not require staining to view the slide. This microscope made it possible to study the cell cycle. The traditional optical microscope has been recently modified into a digital microscope, where instead of directly viewing the object, a charge-coupled device (CCD) camera projects the image to a monitor. Transmission electron microscope (TEM): passes electrons completely through the sample, analogous to basic optical microscopy. This requires careful sample preparation, since electrons are scattered so strongly by most materials.This is a scientific device that allows people to see objects that could normally not be seen by the naked or unaided eye. Scanning Tunneling Microscope (STM): is a powerful technique for viewing surfaces at the atomic level. The SEM and STM can also be considered examples of scanning probe microscopy. Of these techniques AFM and STM are the most commonly used followed by MFM and SNOM/NSOM. Scanning acoustic microscopes use sound waves to measure variations in acoustic impedance. Similar to Sonar in principle, they are used for such jobs as detecting defects in the subsurfaces of materials including those found in integrated circuits.